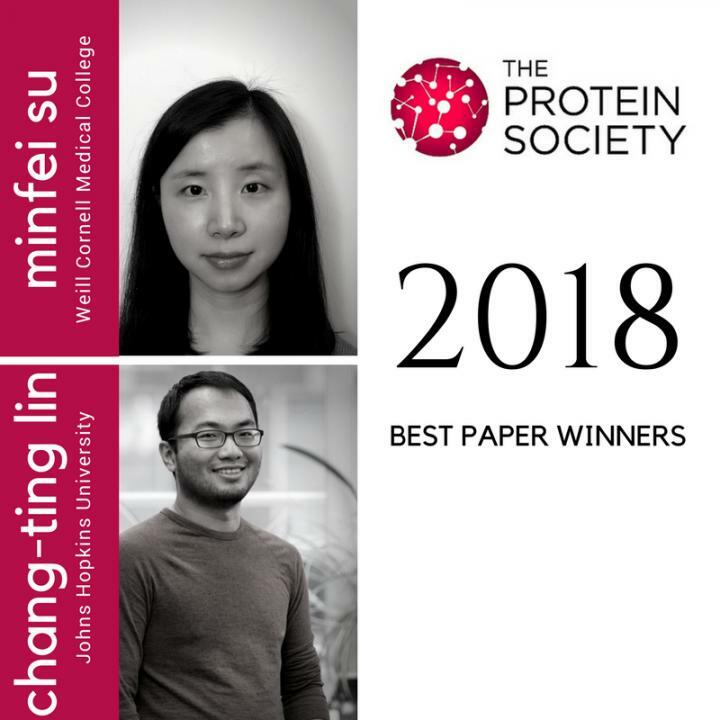 Warmest congratulations to Minfei Su and Chang-Ting Lin , the recipients of the Protein Society's Year 2017 "Best Paper" awards. At the beginning of each year, two "best papers" are selected from articles published in Protein Science during the preceding 12 months. A junior author (typically the first author) is designated as the award winner and invited to give a talk at the following Annual Protein Society Symposium. The first awardee, Minfei Su grew up in Jiangsu Province, China. She obtained a MS in Botany from Nanjing University and a BS in Biotechnology from the Nanjing Agricultural University where she received multiple accolades including "Best-all-round Student Scholarship" and "Outstanding Graduate". In 2010, she was admitted to the Ph.D. program in the Biochemistry Department at North Dakota State University, where she started her graduate studies. As she recalls "during my rotation in Dr. Sangita Sinha's lab, I was fascinated by the beautiful atomic structures of proteins solved by X-ray crystallography and how the structural details of proteins correlate to their functions. I joined Dr. Sinha's lab and started to work on structures of proteins involved in autophagy, a catabolic pathway essential for organismal homeostasis in all eukaryotes. I am very appreciative of the guidance and support from Dr. Sinha over the years which helped me develop commitment towards pursuing a career in academia. I graduated from Dr. Sinha's lab in 2016 and am now a postdoc at Weill Cornell Medical College." Dr. Sinha notes that "Minfei has been an outstanding graduate student with a very strong record in both academics and research". She goes on to say "Minfei led the research reported in the paper 'BECN2 interacts with ATG14 through a metastable coiled-coil to regulate autophagy', as part of her dissertation research in my laboratory. This study provides the first structural information on a BECN2 domain, and delineates similarities and differences in the interaction of the BECN paralogs with ATG14, which is essential for autophagy. Such a comparative understanding of the structural and thermodynamic details of how BECN homologs self-assemble and recruit binding partners is critical to deciphering the molecular decisions that contribute to cellular homeostasis, and also to the evolution of BECN paralogs. This research illustrates the broad expertise Minfei has developed in diverse biophysical methods, biochemical techniques and molecular biology, and is a testament to her hard work, intelligence, dedication to research, and her methodical and organized thought process. She is a very careful experimentalist and thinks deeply about her experimental methods and results. While Minfei performed the majority of the research reported in this paper, she also trained and mentored two students, who then contributed to the research and are coauthors on this paper, illustrating her superb mentoring skills. I am fortunate to have had Minfei in my group, and am exceedingly pleased that such a deserving student will receive this honor." The second Best Paper awardee, Chang-Ting Lin, worked with Taekjip Ha, who describes him as follows: "Chang-Ting came from Taiwan where he had significant research experiences on G-quadruplex forming DNA using more traditional biophysical techniques. During his PhD, he had to move with me to Baltimore. Because his instrument combining total internal reflection fluorescence microscopy with optical tweezers for examining protein movements on long stretched nucleic acids had been built by a previous physics student, he had no prior knowledge on how to rebuild the instrument upon lab relocation. He worked very hard with a senior postdoc to teach himself and took the instrument apart and rebuilt it a couple of times in Illinois before he packed everything up. He was successful in rebuilding the instrument. Chang-Ting is an excellent speaker and always gives engaging talks. As part of the PhD requirement, he gave a talk to the department on optogenetics using the light-oxygen-voltage-sensing (LOV2) domain. He was then inspired to engineer a helicase with LOV2 so he could control the enzyme activity by light. It is still in an early stage but the project has a high risk and high reward flavor and because he was able to publish his first author paper in Protein Science last year, he was able to start this ambitious project." Chang-Ting, himself, adds the following: "My long-standing interest is to understand the dynamics and mechanisms of biomolecule interactions; it all began from my first quantum mechanics course in my freshman year. I was a major in microbiology at the National Taiwan University. During that time I was amazed and attracted by the beauty of sophisticated biomolecules in design. My passion led me to an opportunity to pursue my Masters in Biophysics, where I have characterized how ionic concentration influences inter- and intra-molecular dynamics of non-canonical nucleic acid structures, using thermodynamics, spectroscopy, and quantitative approaches. My desire further guided me to pursue my Ph.D. in Dr. Taekjip Ha's lab, where my training in instrumentation, optics, protein chemistry, and molecular biology have made this finding on HCV NS3 helicase possible. Interdisciplinary training from different fields sometimes can be quite challenging at the initial phase, but it is rewarding and empowering once over the activation barrier. I am blessed to be surrounded by brilliant minds from different backgrounds to brainstorm science with, and have TJ as my advisor, who is very open to new ideas and gives me full support. Heated scientific discussions together with the excitement of new findings in molecular behavior are my primary source of joy and the highlight of my graduate school days. I am now close to finishing my degree and look forward to contributing my biomedical profession in building a better and healthier future for all of us." 1. Su M, Li Y, Wyborny S, Neau D, Chakravarthy S, Levine B, Colbert CL, Sinha SC (2017) BECN2 interacts with ATG14 through a metastable coiled-coil to mediate autophagy. Protein Sci 26:972-984. 2. Lin C-T, Tritschler F, Lee KS, Gu M, Rice CM, Ha T (2017) Single-molecule imaging reveals the translocation and DNA looping dynamics of hepatitis C virus NS3 helicase. Protein Sci 26:1391-1403.